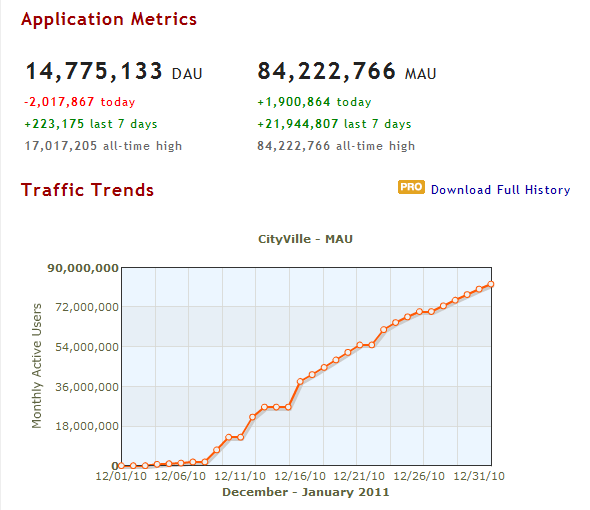 Will CityVille Be First To Blow Past 100 Million Monthly Active Users? Zynga launched CityVille on Facebook just over a month ago, and according to the application page there are now over 84,222,766 users actively playing the game. To put that in perspective, there are about 58 million monthly active users for FarmVille, Zynga’s other hit game. 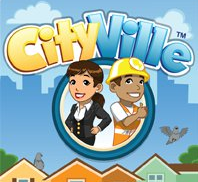 CityVille has thus become the largest app ever on the Facebook platform, by a significant margin. The game attracted nearly 2 million new players today alone, and almost 22 million over the past 7 days. Just look at that nice little curve below, courtesy of AppData. As Inside Social Games points out, FarmVille logged 83.76 million players in March 2010, an all-time high for any app on the platform at the time (and that was when the rules were slightly different). Consider that record shattered now. ISG also forecasts 125 million monthly active users for CityVille down the line. Though growth is bound to level off at some point in the near future, that’s actually a relatively conservative prediction in my book. Looking at the numbers, it appears that CityVille will become the first app/game to surge past 100 million active monthly users within the next two weeks or so.